In January 2015, I sat down with Jan Doyle, host of BCTV’s Classroom Connections and a few of our library’s young Makers to talk about the library’s 3D printer – what it is, what it can do, and how the community can make use of it. The kids on the show were great, already having used the printer in various programs – they are the up and coming engineers of our future. It was a fun show, and Jan was a great host! This is a video a student created from a reading of a poem by Mali. I’m starting a program May 2014 called “Creative Ink” for teens, where we work on poems and writing, and have been doing some poetry research leading up to this program. I’ve found some really neat things – poets and poems – providing some inspiration for the Creative Ink sessions. I’ve got some published poems to read, a couple of poems I’ve written myself to share, and I’ve asked the participants to bring stuff to share – either their favorite work by someone else or themselves. I recently finished a book this morning that knocked me out for a bit, emotionally. I got an advanced reading copy of The Silent History by Eli Horowitz. It was originally written as in serialized form and published as/in an app, which then won a bunch of awards. You downloaded the app, and got a new chapter each week, plus there are many more stories that are only available when you reach a certain GPS location – even though I’ve finished the print version, I think I’ll purchase/download the app, for maybe a different experience. Read more about its concept/conception. The story starts in 2011, when a bunch of kids are born without the ability to create or comprehend language – they can’t speak/think/understand/learn words. No one knows why, and each chapter is told from a different person’s point of view, as if it were a collection of interviews from a reporter compiling a history of the epidemic. Events unfold over the years – it ends around 2044 or something, and tells about how the ‘silents’ grow up, learn how to communicate with facial movements, try to survive on their own, get a tech cure, rebel against it, and how it all affects the people who love them/how they affect their loved ‘silent’. It’s really about loving each other, letting your kids be who they are – and wrestling with the fine line between trying to encourage them to grow and accepting them for exactly who they are. And really, doing the same for yourself. Once you start thinking about it, the project is full of semi-comprehensible little resonances like that. I mean, it’s a lengthy book about the failures of language. It’s an oral history about people who can’t talk. It’s a digital book that is dependent upon engagement with the physical world. I recently received a call from a neighboring library asking for some research help. An author was looking for reviews of Orson Welles’ “Too Much Johnson” which was staged in Stony Creek in 1938. I checked our microfilm records from the Branford Review and found a little information – a couple of ads for the play, and not-too-in-depth reviews. I sent PDFs of what I found back to the library and was happy imagining that I was maybe contributing to a future book. A few days later, news broke that film from “Too Much Johnson” had been discovered in Italy. This film was intended to be shown in conjunction with the play. The play itself is a revival of a three-act comedy originally written in 1893. It’s a farce about a married womanizer who pretends to be a Cuban plantation owner named Johnson to carry out an affair – only to find out there actually is a Cuban plantation owner named Johnson. Welles directed about 40 minutes of film, in three sections. The film shorts were to be shown before each act. For a deeper analysis of the film, check out this site. There is a preview of the film on youtube, you can see what Welles hath wrought. What I don’t completely understand is that in the analysis, it says the previews were suspended after a week. However, the records from the Branford Review seem to indicate a second week of the show. Who knows what really went down? But it sure is fun to see these old articles. Click on an image to see it larger. I read two nonfiction books. In a row. That’s huge for me. But they were both really good, both about exploration – though about exploring different things. In The Lost City of Z: a tale of deadly obsession in the Amazon, author David Grann writes about Percy Fawcett, a British explorer in the early 1900s. He spent lots of time in the Amazon, looking for proof of a lost city. On his last trip into the Amazon, he and his son and his son’s friend simply disappeared into the jungle and were never heard from again. Many, many people have tried to follow in his footsteps, searching for traces of him, clues about what happened, anything. Some of those people have just disappeared. Others have made it out of the jungle alive, but just barely. The author, David Grann, begins researching Fawcett and his travels, makes some new discoveries (after all this time), and ends up like many others – trying to track Fawcett through the jungle. It’s a fascinating story, a true page-turner and has some really interesting history from the 20s-30s. I’ve since gotten the book Exploration Fawcett, which is a collection of accounts, manuscripts, log books and journals from Fawcett and was published by his remaining son. Looking forward to that one! As for Scatter, Adapt, and Remember, by Annalee Newitz, it’s an exploration of the earth’s ancient past – the mass extinction events we’ve had, the life forms that have evolved over time, and an exploration of we are doing and should be doing to try and save ourselves in the event of another extinction event. I’ve been sitting on this book, which was given to me by a certain JM, for a while – I am into the science fiction stories which deal with post-apocalyptic society, looking at how people cope with a new set of rules for living, and so I knew I should be into this book, but it took me a while to crack it open. I really enjoyed the first 2/3 of the book. The section on earth’s history was really interesting – it was a punchy romp through different eras and megavolcanoes and the “Great Dying”. The author covered the migration of homo eraster and homo sapien, and talked about the different theories of how those tribes merged. The first section is basically about how the earth survives, and how living beings have evolved and survived all these cataclysmic events. The rest of the book covers different ideas on how humans can survive and thrive in a changing world – many, many scientists are hard at work at researching energy alternatives, food supply alternatives, building materials alternatives, all trying to find new ways to live should our world be devastated. At the end of the book, the author spends a little time exploring ideas about living in space/on other planets. This book is not a crack-pot “the sky is falling” kind of read. It’s a well-thought-out and well-researched look at how living things adapt and survive in the face of a mass threat, and what we can learn and work on for ourselves. Reading this also prompted me to pick up a copy of The World Without Us by Alan Weisman, which explores how our man-made structures will be reclaimed by nature once humans are no longer around. A good book definitely starts a trail – it’s up to you to continue down a path and follow it where it will go. Who knows where you’ll end up? Just got a new book in to read: Ivy Pochoda’s Visitation Street. It’s a Dennis Lehane imprint, about two girls who disappear from the waters around Brooklyn one night. Only one survives, no one knows what really happened. The action takes place during a heat wave where the temps are in the high 90’s… sitting outside tonight, in the 90-something degree air, reading this while my daughter plays on the Slip ‘n’ Slide… feels like I’m reading in 3D. A virtual-reality book. Heat-o-vision. Something like that. Very timely to have this book come in for me today. I finished the book. The day after I started it. I guess I liked it. It was a good read – interesting, some mystery, characters you care about, good people who make bad decisions and not-so-good people who try to do the right thing. The book left me feeling a little melancholy, not sad really, but thoughtful. Mindful. Peaceful. It has a few weird, metaphysical notes in the middle, some elements of danger, but in the end, you’re left with a little bit of hope. A good summer read. A few days later, I was thinking about it. The “visitation” title in the title is the name of the street people live on. It’s also about how people come and go, they visit your life for a while, and then you have to move on. Some people are visited by voices of the dead – they hear them constantly, talk to them, learn from them. And eventually, even those visits are over. What’s left is the person, alone – but that’s not a bad thing, necessarily. The New York Times has some nice things to say about this book, too. Check it out – it’s a good summer read. 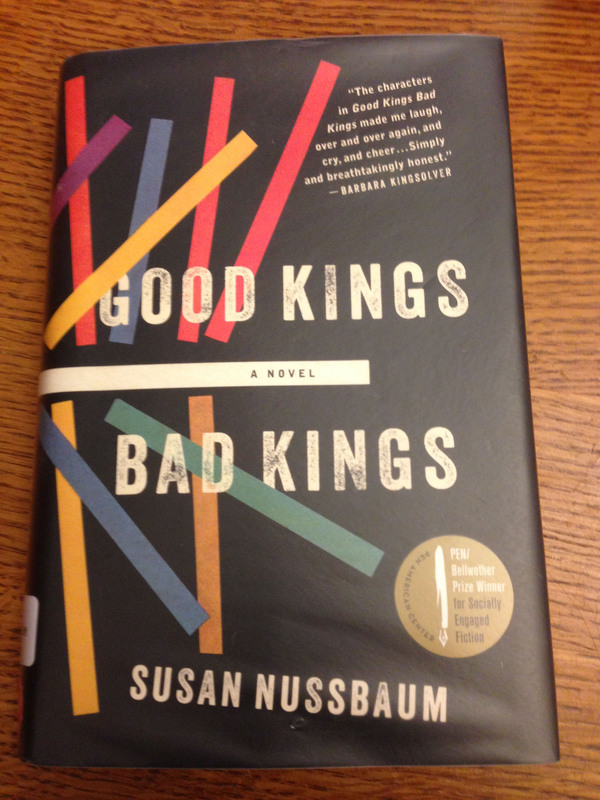 Good Kings Bad Kings is a PEN/B ellwether prize winning novel from Susan Nussbaum. It won in the category of socially engaged fiction. The story follows a number of characters – different chapters from different points of view tell the story. Nussbaum is able to effectively change tone and voice with each character. The main setting of the novel is the ILLC – effectively a nursing home for kids and teens with disabilities. This is the place kids are sent when they have no where else to go – they can’t afford private assistance and maybe don’t even have a family or their support. Nussbaum is a playwright who has been celebrated for her honest voice, and in this, her debut novel, her voice feels exactly that, no matter which character she’s inhabiting. I wasn’t sure how much she’d tug on the heart strings in this novel and was a little wary, but I liked the idea of the multiple points of view, and the characters sounded interesting. There’s Yessenia, a tough-skinned teen recently out of Juvie – it’s only a few pages in that you realize she’s in a wheelchair. Teddy, another teen living in the ILLC, dreams of having his own place one day. Joanne, a data-entry clerk who starts working at the ILLC – she’s the only disabled adult working in the place. There are other characters, and the ways their lives weave in and out of each other’s are interesting. This story could easily slip into being sickeningly sweet, glaringly archetypically obvious, or heart-wrenchingly unbearable. But it doesn’t. While it was a criticism of institutions and group homes, it was really about the characters, the teens, the adults, and their own ways of dealing with the world.